Chris and JonM rightly chastised my previous post on United's Fuel Hedging strategy. I failed to adequately explain the underlying assumptions to support the statement. 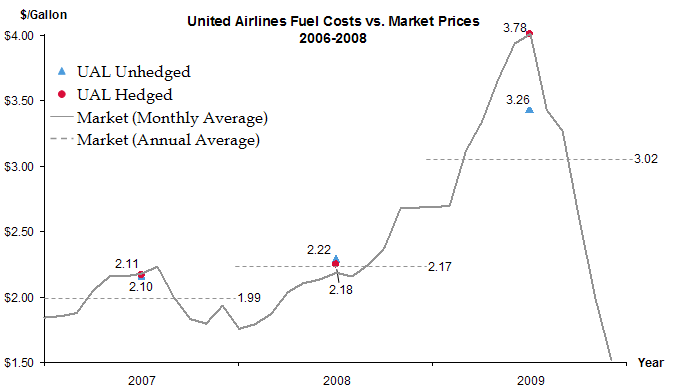 1) United did hedge fuel prices, locking in their fuel prices. Unfortunately they locked them in at level that guarantees an operating loss. I think a firm that locks in a loss to minimize risk isn't really thinking through the point of hedging. 2) United appears to have done minimal hedging through 2006 & 2007, only launching on a massive hedging action in 2008. In other words, they got off the avgas variation train at a specific time; that itself, to me, is a speculative move. Perhaps I'm garbling the definitions of hedge & speculate, but I can state on more firm ground that UAL launching a fuel hedging program in 2008 was pretty stupid. United hedged their fuel cost exposure, eliminating uncertainty about whether they would make a profit. They locked in an operating loss, regardless of the price of fuel.